There’s a lot to be said for not buggering up a winning formula. And there’s something to be said in 2018 for a premier brand. Samsung's Galaxy S9 is the best all-round Android phone you can buy. You’ll find phones that can do most of what it does that are much cheaper, and nothing depreciates faster than a Samsung Galaxy - that’s official. But consider the whole deal: the style, the after-market support, the accessories, the care taken with the product, and the coherence of the whole thing - and Galaxy is top of the pile. And that’s even after noisy neighbour Huawei has barged into the smartphone premier league so noisily beating its chest. And you notice the Bixby button is still there. In fact Samsung's biggest competitor, now that people hang on to their phones for ages and SIM-free deals abound, is Samsung itself. If you're upgrading from three years ago you probably won't think twice. Otherwise, if you're coming from a recent competitor, the Samsung S8 Galaxy offers much the same proposition for much less. 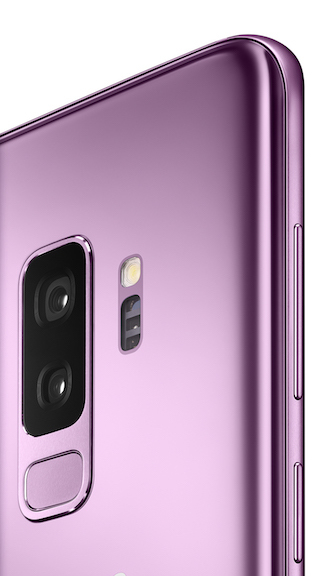 First off, the Galaxy S9 really must be one of the most beautiful consumer products ever made. It’s what you wanted the future to look like when you were watching Tomorrow’s World in the 1970s. Only the future turned out to be billions of generic boxy rectangles. The S8 and S9 are emphatically not boxy rectangles, and it’s as pleasing to find something as nice to hold as it is to look at. That was never really true of another modern classic, the great Apple iPhone 4 design (now reincarnated as the iPhone SE). For something closer to a grand than £500, why shouldn’t it have Qi and waterproofing? And it has done this without creating a fricking notch. It should get a Posh Design Award just for that. 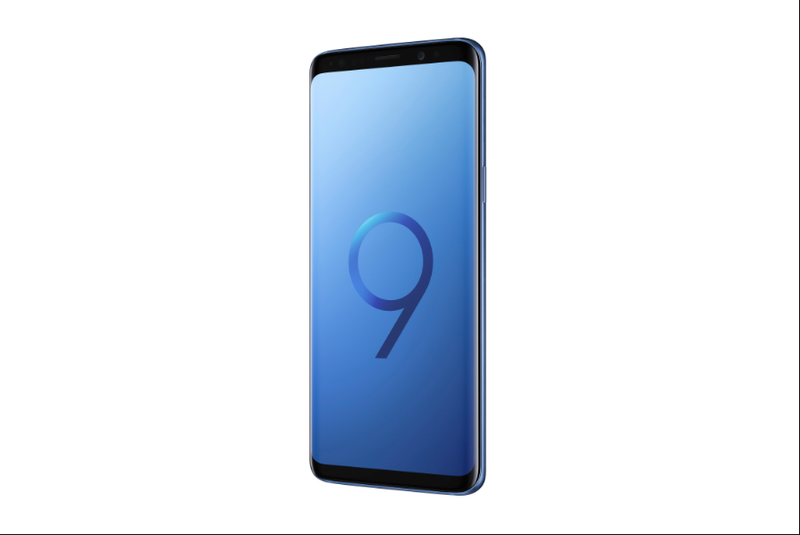 You'll know by now that the Galaxy S9 is practically identical to last year’s S8, and Samsung's curved glass displays have been on the market since 2015. But I feel this can’t be emphasised enough: with prices creeping up to £1,000, at least Samsung offers you something that looks and feels like luxury. The Samsung S9’s OLED display is still the best. Until LG starts to notch up some design wins for its curved OLED panels, it’s going to remain so. As with last year’s S8, the screen is even better than it appears out of the box, as Samsung has reduced the resolution to save power. You can crank it up too. The Galaxy S9 also deserves its place at the top of the pile for the dozens of small considerations. For a Google or a Motorola, the philosophy is to muck around as little as possible with Android, which is fine, and a lot of you appreciate that. But with something in the “premium” price bracket, why not make an effort? Samsung does, and it does so in a much more restrained way than it used to. For example, the Edge Panel, which slides over from the side, is genuinely useful, and became my app/person switcher. And for something closer to a grand than £500, why shouldn’t it have Qi and waterproofing? And it’s done this without creating a fricking notch. It should get a Posh Design Award just for that. In a nutshell, the design is almost identical to last year’s Galaxy S8, with the fingerprint sensor positioned in a slightly (but not a lot) more sensible position. And a new imaging rig - which we'll get to in a bit. It’s a millimetre longer and thanks to a sturdier aluminium frame, half a millimetre fatter - which isn’t noticeable. The default is still 64GB of storage, and 4GB of RAM, and the non-removable battery remains at 3000mAh. So it’s really the same, but a bit faster. The big change to the out-of-the-box user experience this year over last year is that Bixby is not "in yer face" the whole time. A year ago I described The S8+ as “like a nine-course meal of desserts – tiramisus, trifles, ice creams, one after another – that you have to eat with chopsticks and a straw.” Bixby was half the problem. Bixby was an AI assistant launched with great fanfare at MWC 2017. Samsung would understand what you were saying, identify things, and be a general helpful puppy. Samsung gave Bixby a dedicated button: something the camera didn’t get. US English voice support was months late and UK English not at all. The benefits of this feature were occasionally tangible, often half-baked, and rarely appreciated. Bixby Voice didn’t support UK English. "Please smear the camera lens with your finger"
Samsung had committed the Clippy The Paperclip crime of thrusting unwanted intrusions at you when they were not needed. For a while, it brazened it out: No, you Can Not turn off Bixby. Eventually the Korean giant realised that this feature, with its dedicated button, was not helping, so made it easier to disable. Bixby makes a half-hearted attempt for your attention, then largely gives up. Once you’ve turned it off, Bixby really won’t bother you again. With the S9, Bixby can actually begin to do useful things - at least things some of you may find useful, like deep integration into the system to access settings or complete actions: something Motorola blazed a trail with. But Bixby still won’t support UK English. I wish the other “assistants” were as easy to disable, and perhaps in the post-Facebook meltdown era, punters will be a bit smarter about what data they surrender. Alas, I found the placement of the fingerprint sensor underneath the camera to be a little better - but still too close to the camera itself, resulting in unwanted smudges. A centimetre would have made a big difference, making it easier to reach too. If practically everyone else can do it, I can't see why Samsung can't. Overall you'd be hard pressed to find many differences in this year's over last year's UX. 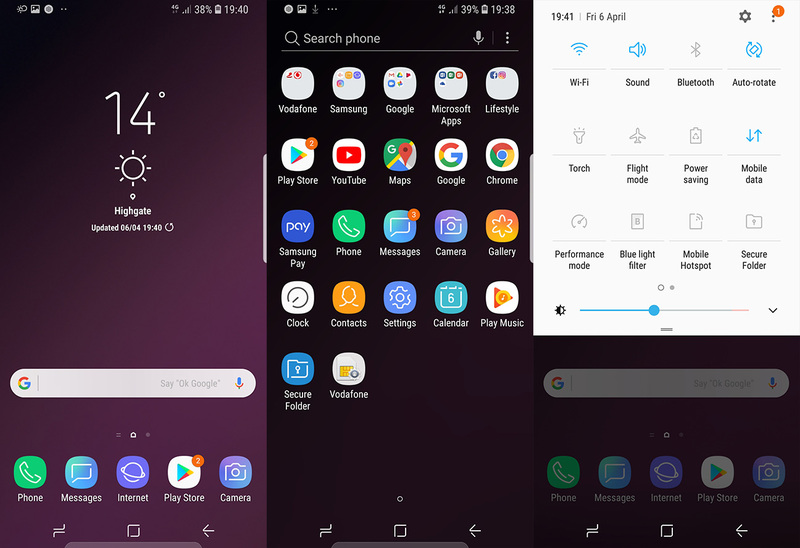 Samsung has toned down the aggressive TouchWiz UI over the years, and even more so since it introduced a new design language it calls "Grace UX" in mid-2016. So, a Samsung shipping today no longer boasts an S-this or S-that. In fact, things that should or justifiably could be bundled - like the S-Finder search app and Samsung's really rather excellent version of Garageband, Soundcamp - are optional downloads. There's still some duplication: Samsung wants your images in Samsung's cloud, and so does Google. But less than before. For the first time that I can recall on a Galaxy, I wasn't prompted to download Google Play Services. Less bloat than ever this year. I do wish Samsung would bundle a few more themes, or pay quality theme designers to include a couple in its Theme store for free. Most of what's in the Samsung store is whimsical, and costs money. For those determined to purge the S9 more thoroughly, there's a guide here. The Samsung browser continues to improve, touting a night mode, and with a couple of clicks you can install an ad-blocker. I noticed the Samsung password service being pushed hard this year. 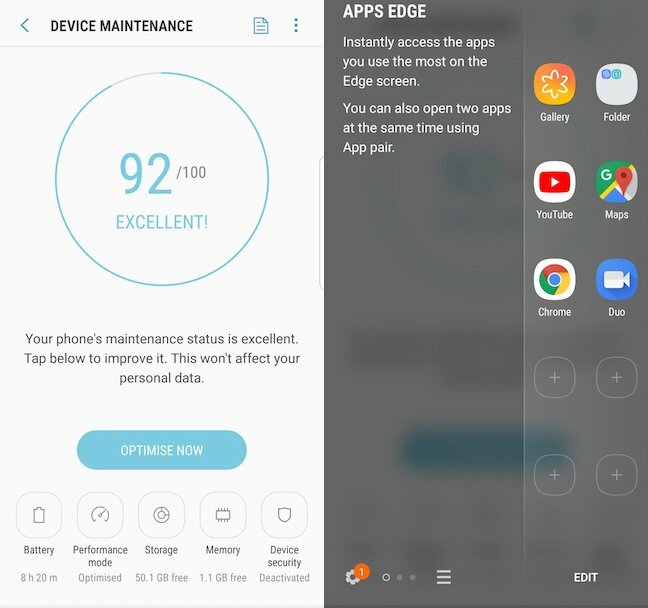 The Device Maintenance app introduced in Android 7.0 is more prominent, and offers a dashboard for the power saving profiles and cleaning up the system. Samsung does push its Pay app, and this has genuine advantages over Google and Apple's payments setup - but over a year after launch it still doesn't work with Barclays, Lloyds or other important retail banks.